It's true I love Davis Square. 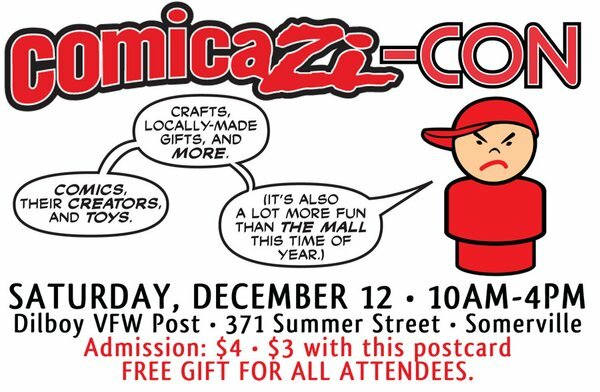 If you or someone you know is into comic books et cetera, then think about Comicazicon & Bad*ss Christmas Bazaar at Dilboy Hall ($1 admission coupon). The Brattle basically offers a free monthly film appreciation course with their "Elements Of Cinema" series. I will definitely go to this, if I ever wake up early enough. Prof. Nadia Smith (History, BC) has written a biography of Macardle, so she'll attend to introduce the film and join in the discussion. Adaptations of Truman Capote's "A Christmas Memory" and Grace Paley's "The Loudest Voice". Find discount code and showtimes (and more) here in the post below. Sadly, Brother Blue is no longer with us in corporeal form, but he lives in many hearts and minds. Poets, storytellers, and musicians will celebrate the great man for an "evening of poems, storytelling, and folk music." Why is the Dept of Sanskrit & Indian Studies sponsoring the event? I don't know. It's going to be a damn good punk show all the way 'round. I'm not sure about the amount, but I'm guessing it'll be close to the last Friday night Castlebar live music cover charge. Interesting line-up of mostly gentle music. Curtis Harvey is known for "slowcore" stuff with Rex in the past, but his solo album is in a intricate folk vein. With Glorytellers, ex-Karate man Geoff Farina's new band still gets a little jazzy with some folk tinges in the mellowness; sounds good to me. Farina has also recorded a CD with Chris Brokaw of pre-war country blues, so I'm guessing they'll do a set in that style. Maybe I'm just a sucker for uber-catchy melodies and genre-hopping rock, but my favorite band is the home-girls, Mrs Danvers. Although Brian Viglione of Dresden Dolls is playing drums for The Cliks, which has an exciting, guitar-heavy rock trio with some killer songs and an interesting backstory. The singer's vocals sound like a woman, and it's not that unusual since he used to be a woman... His fellow Toronto-ites Hunter Valentine are along for the rides with decent canuck-rock. Barrence Whitfield should be more widely as the rock ' soul king of Boston. There are times when I get excited and exaggerate, but this man is amazing. With his mighty soulful singing, he should be in the pantheon of rock/r&b singers. He is something like a missing musical link that skipped from Little Richard directly to the Boston rock scene of the '80s. The Monkey Hips are a squad of rockin' dudes including a sax player. Thru 12/27: "Tru Grace: Holiday Memoirs"
WED 12/2: Cupcake, Talks, Music Awards, Bingo!